Carl O. Albrecht was born in Philadelphia, Pennsylvania in 1931. Albrecht graduated from John Bartram High School in 1949. He lived in Upper Providence, PA since 1962. A graduate of Drexel University in Philadelphia, he received his BS in Mechanical Engineering in 1954 and MS in Aeronautical Engineering in 1957. He spent most of his career at Boeing Helicopters Division in Ridley Park, PA, as Chief of Structures Technology. He participated in virtually all of the aircraft designed at Piasecki Helicopters / Vertol / Vertol-Division of Boeing, Boeing Defense and Space Group, and Boeing-Philadelphia. These helicopters included the HUP, H-21/commercial V-44, H-16, Heavy Lift, VZ-2/V-76 tiltwing, V-107 prototype/CH-46, CH-47, V-22 Osprey and RAH-66 Comanche. After his retirement from Boeing, he served as a Consultant to both Piasecki Aircraft and Boeing and served as a docent at the American Helicopter Museum and Educational Center. He served on a NASA ARTS Committee, Rotorcraft Airworthiness Group, AHS Structures & Materials Committee, AHS Technical Council, and was Session Chairman for numerous AHS meetings. He presented 15 technical papers, some overseas in France, England and China, and traveled the world investigating helicopter accidents. 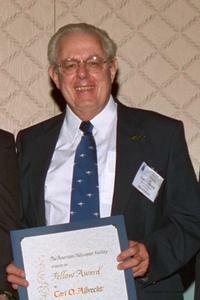 Albrecht joined AHS in 1954 and was an Emeritus Member. Carl O. Albrecht passed away on August 25, 2014, at the age of 82.